In February, Castle Pines Village residents Andrew Gleason and Dane Westen will realize their dream of playing hockey in Canada against the best teams from around the world in the Quebec International Peewee Hockey Tournament. They achieved this honor along with their Arapahoe Warriors team when they won the Quebec Qualifier tournament in November. Andrew Gleason and Dane Westen are two 12-year-old boys who will soon experience the opportunity of a lifetime. The boys, who both reside in Castle Pines Village are good friends and hockey teammates. Next month, they will have the opportunity to play with their team at an elite tournament in Quebec, Canada courtesy of the Colorado Avalanche. Gleason and Westen have both been skating since they were three years old and they currently play for the Arapahoe Warriors Youth Hockey Association at the Colorado Peewee AA level. Their team participated in the very prestigious Quebec Qualifier tournament at the Pepsi Center in November, where they played against the very best peewee teams in Colorado. Their team played hard and won the tournament and will now represent the state of Colorado in February at the Tournoi International de Hockey Pee-Wee de Quebec, or the Quebec International Peewee Hockey Tournament. The Quebec International Peewee Hockey Tournament has been held since 1960 and is an extremely prestigious tournament that features the very best peewee teams from around the world. Past participants in the tournament include well-known players Wayne Gretzky, Mario Lemieux, and Patrick Roy. This year, approximately 100 teams representing countries throughout the world will participate. Gleason and Westen are thrilled to have the opportunity to travel to Quebec with their team, where they will live with host families and fully experience French Canadian culture while playing hockey in a tournament of great historical significance. 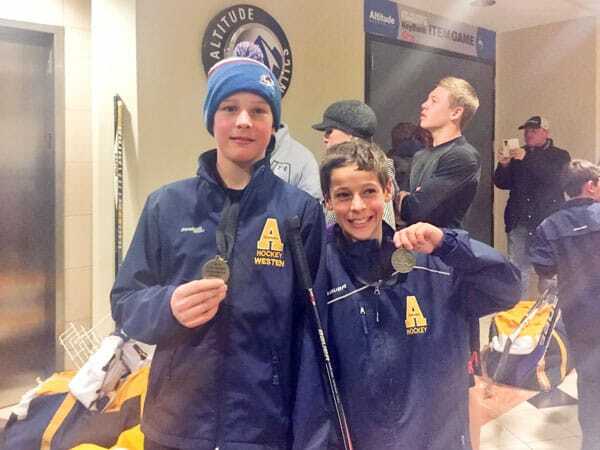 Good friends and schoolmates Dane Westen and Andrew Gleason proudly displayed the medals they earned after their hockey team won the very competitive tournament. The boys have been playing hockey together since they were six years old and were thrilled to share this honor together. Another thrill for the boys is that their team will be entirely sponsored and supported by the Colorado Avalanche. The Avalanche are paying for the team to attend and their coaches and team manager will travel to Quebec for two weeks to practice with the team. Additionally, the boys will wear Avalanche hockey gear and are now considered the “Junior Avalanche” and will play in the tournament under that name. The boys also had the honor of presenting awards to the “20th Anniversary Team” during a special ceremony in December as part of the Colorado Avalanche’s 20th Anniversary season. Overall, the experience has been amazing for these young athletes. Andrew Gleason is pictured here immediately after scoring which brought his team even closer to their goal of traveling to Canada to play in an elite tournament. The Regional Transportation District (RTD) will implement a new fare structure effective January 1 designed to streamline the way passengers pay for trips across the agency’s expanding transit system. New features include day passes offering riders unlimited trips through the entire service day for the cost of a single round trip; simplified rail zones; a flat $9 fare for services to and from Denver International Airport; printers aboard buses for day pass purchases; and reclassified bus routes to simplify service categories. To prepare for the changes, RTD is asking passengers to “know your fare” before the new policies take effect. Riders should look into the best way to get to their destination, how much it will cost, and where to buy the appropriate fare media. RTD’s new fare structure stems from a nearly two-year process that included extensive public engagement across the eight-county Denver metro region. “The public gave great input, RTD listened, and now we have a simplified, more equitable fare structure that will help connect people with our system and to one another across the metro area,” said RTD Board of Directors Chair Chuck Sisk. Discounted fares are available for seniors 65+, individuals with disabilities, Medicare recipients, and elementary, middle and high school students ages 6 to 19. Proof of eligibility must be provided when boarding. Active duty members of the U.S. military currently ride for free on all RTD services. Learn more about discount fares, proof of eligibility requirements and special discount cards by calling 303-299-2667. Riders can purchase one-way tickets and day passes aboard buses or at ticket vending machines at rail stations. They can also buy fare products at Union Station, Civic Center Station, DIA, Downtown Boulder Station, and Boulder Junction at Depot Square Station. Select King Soopers and Safeway stores also sell RTD fare products, including 10-Ride ticket books, Access-a-Ride ticket books, day-pass ticket books, and monthly passes. In addition to introducing new fares, RTD will open five transit corridors in 2016 and launch a pilot of its new MyRide smart card program. RTD’s newest fleet addition is the U.S. 36 Flatiron Flyer bus rapid transit system, which opens January 3. Customers will have the opportunity to try the new service at no cost on January 4. RTD’s mission is to provide safe, clean, reliable, courteous, accessible and cost-effective bus and rail services in the eight-county district, and fulfills 100 million passenger trips annually. The public transit agency is creating a larger, better and more accessible system through innovation, public-private partnerships and transit-oriented communities. For additional information, visit www.rtd-denver.com. This aerial drawing shows the location of the soon-to-be built Sierra Grill in the northeast corner of RidgeGate Commons and the partially excavated area in the southeast corner where the Marriot TownePlace will be located. Two new projects will soon be underway on land that is adjacent to the Cabela’s store in Lone Tree. City Council approved the Sierra Grill restaurant and the Marriott TownePlace Suites hotel with plans to break ground in early 2016 and open in mid-to-late summer. The 8,445 square-foot Sierra Grill will be located at 10674 Cabela Drive on the crest of the hill on the northwest corner of the Cabela’s lot. The restaurant will feature high-quality, homemade American cuisine and may also include an element of Mexican fare. The complete menu is still being determined. William and Mark Brinkerhoff, owners of the well-known La Loma Mexican restaurant in northwest Denver and the new Sierra Grill purchased the land from Coventry Development after several years of planning the new restaurant. “This is a great location and we are excited to open a unique culinary gathering place for families, friends, business people, and visitors to Lone Tree,” stated Mark Brinkerhoff. A pedestrian pathway featuring a courtyard and a deck is planned between the restaurant and the new adjacent Marriott hotel. Groundbreaking is planned for January with completion around September. “I’ve already heard from residents who say they are excited for the opportunity to enjoy a nice meal at Sierra Grill before heading to a show at the Lone Tree Arts Center,” stated Lone Tree Mayor Jim Gunning. The Marriott TownePlace Suites hotel will be a four-story, 121 room hotel sitting on 3.31 acres west of Cabela’s. The hotel will feature accommodations integrating an extended stay concept. All room types will include a kitchen area. The structure will have a backdrop of the bluffs and grassy hillsides and be landscaped to maintain the unique attributes of the area. The Marriott wants to encourage pedestrian and bicycle traffic to the surrounding trails and commercial areas. Close to the East-West Regional Trail, the hotel’s pedestrian/bike path will feature a bike hut near the public trail head equipped with seating, water, a bicycle pump, and tools for public use. The hotel is scheduled to open in July 2016. An architectural design of the Sierra Grill (left) and Marriott TownePlace Suites (right) that will be built in 2016 at RidgeGate Commons. This rendering illustrates that the future Marriott TownePlace Suites hotel will be located west of Cabela’s and will feature a bike hut outfitted with water, a bicycle pump, and tools. The secret is out – Castle Rock is a great place to live and play outdoors. Soon, a new pedestrian bridge will help connect the Town of Castle Rock (Town) trail system and make discovering this great community even easier. Construction on the new Wolfensberger Pedestrian Bridge is scheduled to begin this week. The pedestrian bridge will connect Philip S. Miller Park and Ridgeline Open Space and will create a continuous 17-mile native surface trail that will bring together more than 650 acres in park space. The project was a team effort. Town Council approved the contract earlier this year, recognizing the importance of trail connectivity to the entire community. Designing and building the project this year helped save the Town more than $58,000 in materials and labor. Plus, developer National Covenant Properties donated two acres of land for the bridge location, and the builder, DR Horton, will help with grading for the project. The $702,750 project will be funded through an annual trail construction allocation from the Town’s transportation fund and remaining unexpended funds from the 2014 budget for the Ridge Road and Crowfoot Valley Road/Founders Parkway sidepath project. The connection is also an important component of a large future trail loop that will connect the East Plum Creek Trail with The Meadows and downtown Castle Rock. The bridge will be similar to the Crystal Valley Parkway pedestrian bridge but will be 25 feet longer and will have a weathered steel finish to match the natural character of the surrounding open space. The bridge has already been constructed off-site and will be placed early next year. Watch CRgov.com for related temporary road closure information. Weather permitting, the project will be constructed alongside the Philip S. Miller Park phase two improvements. Both projects are expected to be completed, weather permitting in spring 2016. More information, including project updates, is available at CRgov.com/WPedBridge. For additional questions, contact project manager Rich Havel at 720-733-4482 or rhavel@CRgov.com. A recreation master plan will help determine future amenities at Rueter-Hess Reservoir. Residents are encouraged to participate in the online survey by January 8. The Rueter-Hess Reservoir Recreation Authority (Recreation Authority), comprised of the Parker Water & Sanitation District and its five regional partners – Castle Pines, Castle Rock, Douglas County, Lone Tree, and Parker – is developing a recreation master plan for the Rueter-Hess Reservoir. As part of the public process, a survey has been posted online to get initial input from area residents about recreation activities at the reservoir, as well as the 425 acres on the north side of Hess Road across from the reservoir. The survey, which takes just a few minutes to complete, will remain open through close of business day on Friday, January 8. The goal of the master plan is to develop a range of recreational opportunities in and around the reservoir while providing safe, clean drinking water and preserving the tranquil qualities of the site. Recreational uses that could jeopardize the water quality of the reservoir, such as motorized boats, dog parks near the water, swim beaches, and other uses that have potential risk are not being considered. Possible programs for each site have been classified into five categories, including: Natural Areas (bird watching, a wildlife preserve, open space, etc. ); Trails (hiking, incline challenge, mountain biking, etc. ); Aquatic Activities (fishing, non-motorized small boats, scuba diving, etc. ); Cultural Programs (outdoor classroom/pavilion area, etc. ); and Adventure Recreation (overnight tent camping, bouldering, etc). Public meetings in February will review survey results to determine a preferred master plan option, and the preferred option will be presented at a public meeting tentatively planned for the end of April. Visit www.pwsd.org for additional information and to complete the survey. Editor’s Note: On the final page of the survey, it asks what city you live in (in order to track where the responses are coming from). Please be sure to include your city AND your zip code if you live in 80108. SnowSports 365 is a winter sports park being considered by the Town of Castle Rock to be located at Philip S. Miller Park. SnowSports 365, a newly proposed year-round winter sports park for the Philip S. Miller Park in Castle Rock, is currently under consideration by the Town of Castle Rock (Town). Early suggested design features for the park include various ski/snowboard jumps, moguls, and rails supported by a lift or moving carpet system, snow tubing, and a lodge or concession building. Town council voted unanimously in December 2015 to approve a memorandum of understanding (MOU) with P3 Advisors, LLC, SnowSports 365’s developer. The MOU signifies that both parties are committed to continuing their good faith efforts with regard to developing the project; no contractual rights or obligations have been established as of press time. The MOU identifies approximately 9.5 acres of land at Philip S. Miller Park for the SnowSports 365 project. The future lease would establish a commitment of 20 to 25 years with two subsequent 10-year optional terms. The entire cost of the project is estimated at $28 million, to be funded by P3 Advisors. A $2.7 million loan from the Town to P3 Advisors has been approved to help pay for improvements that will help benefit the entire park, including additional parking lots, utility extensions, and additional lighting. P3 Advisors and the Town are estimating that the new park could draw 170,000 visitors annually. Following the approval of the MOU, the parties are working on a potential development agreement. According to P3 Advisors, the project’s artificial ski surface is made from a premium, engineered polymer surface called Snowflex. When misted with water, the Snowflex surface provides a skiing experience similar to snow and, in addition to offering a softer and safer surface for falls, makes it suitable for year-round use. Snowflex was designed and developed by Briton Engineering and was first introduced at Liberty Mountain Snowflex Center, located on Liberty University’s 5,000-acre mountain in Lynchburg, Virginia. For further information about the SnowSports 365 project and upcoming public hearings, visit CRgov.com/parksandrec. Firefighters extinguish a house fire on November 21 in Lone Tree that was started by a charging Lithium polymer battery. South Metro Fire Rescue would like to alert residents about a real and present fire danger that could exist in your home this season. In 2015, South Metro Fire Rescue responded to three house fires this year involving Lithium polymer batteries in battery operated cars and airplanes. The number of fires could rise as the popularity of hover boards, drones and remote control cars and toys continues to grow. – A swollen battery is no longer safe to use and can cause a fire if use is continued. If you puncture a swollen battery that still has a charge, a fire can occur. For more safety tips, visit www.southmetro.org. Firefighters demonstrated the volatility of Lithium polymer batteries at the South Metro Fire Rescue training center in Parker. Firefighters intentionally overcharged a battery and then punctured it with a nail, causing it to explode into flames. Drop-off time/dates: Anytime December 26 through January 31, 2016. Drop-off time/dates: 6 a.m. to 11 p.m., December 25 through January 29, 2016. Drop-off time/dates: Anytime December 25 through January 15, 2016. For more information about holiday tree recycling, call the Town of Castle Rock at 303-814-7444, the Town of Parker at 303-840-9546, the Highlands Ranch Metro District at 303-791-0430 or visit www.douglas.co.us/government/departments/parks-trails-building-grounds/christmas-tree-recycling/. If you are unable to recycle your tree, most trash removal companies will pick up trees curbside. Check with your individual HOA management companies for specifics. In 2014, polar plungers Detective Chad Teller, Sergeant Ron Hanavan, Captain Jason Kennedy, and County Attorney Kelly Dunaway jumped in the freezing water – Armani suits and all. Spectators are encouraged to bundle up and cheer on Douglas County’s local law enforcement heroes for the Polar Plunge at the Aurora Reservoir on February 20 and support the Special Olympics of Colorado. Joining Blanchard in the Douglas County Sheriff’s Office 2016 Polar Plunge on February 20 at the Aurora Reservoir are some notable individuals. Sheriff Tony Spurlock, Undersheriff Holly Nicholson-Kluth, Division Chief Steve Johnson, Division Chief Tim Moore, Captain Darren Weekly and Corporal Chris Stadler, as well as numerous fellow deputies and specialists are the daring divers who have dubbed themselves as the “Douglas County Sheriff’s Office Shock & Thaw” team. Jump in and take the plunge! Participants can register at www.specialolympicsco.org; the fee is $75. If you are able to financially contribute to this great cause, there are two additional ways to make a donation: (1) write a check payable to “Douglas County Sheriff’s Office” with “Polar Plunge” in the memo line, then mail or hand deliver to the Douglas County Sheriff’s Office Community Resources Division, 4000 Justice Way, Castle Rock, CO, 80109; or (2) log on to theas Special Olympics website to donate via credit card at http://www.specialolympicsco.org/give/polar-plunge/. Soccer fields are available at all three parks and baseball fields are available at Coyote Ridge Park and The Retreat Park. Requests for spring practices will be accepted starting January 11. Residents pay $25/hour and non-residents pay $35/hour to help defray costs for maintenance of the fields. Residents can reserve the picnic pavilions at Coyote Ridge Park for $25/hour ($50/hour for non-residents). The Retreat Park picnic area is available on a first-come, first-served basis. Visit http://cpnmd.org/facility-reservations/, complete the online request form, and return it via email to Patty Hoffman at patty@cpnmd.org or Susan Nagel at susan@cpnmd.org. For more information, call 303-242-3267. Elk Ridge Park is located just northeast of American Academy charter school. It features a synthetic multi-purpose field, as well as three picnic pavilions. Field reservation applications for the spring/summer will be accepted beginning at midnight on January 10 with assignments being announced during the first week of March. Fees for usage are $30 for two-hour blocks for half of the field and $60 for two-hour blocks for the full field. Pavilion rentals at Elk Ridge Park are available on a first-come, first-served basis and are primarily for residents in Castle Pines, but rates are available for non-resident use, too. Rental fees are as follows: Residents – $35 (large pavilion) and $25 (smaller pavilions); and non-residents – $70 (large pavilion) and $50 (small pavilions). All pavilions require a $100 refundable security deposit. Visit www.castlepinesgov.com, click on “Departments” and then on “Parks & Recreation” for more details and to download application forms and to review policies. Applications and deposits can be dropped off at the City of Castle Pines office, located at 7501 Village Square Drive, Suite 100. For more information, please contact Sharon Washington at sharon.washington@castlepines.gov or call 303-705-0226.